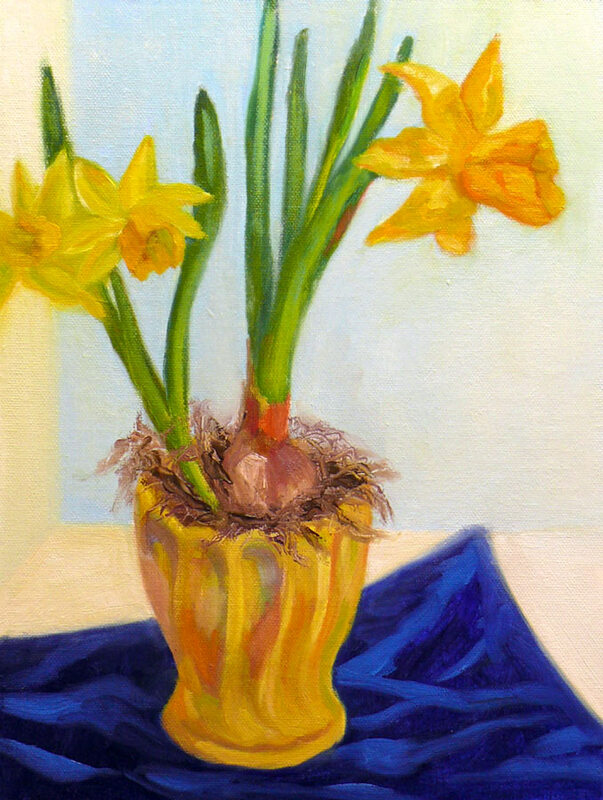 In between a million (well, maybe 25) other things this weekend I made another attempt at painting these daffodils from life. I don’t think I’ve nailed it yet, and was amused by how the flower on the right turned into anything but a miniature daffodil like it’s sisters on the left. It just kept growing and growing but I let it because I liked it. There’s a lot I still need to learn and figure out (having to do especially with the effects of light but also how to set up a still life with more interesting background) but I’m happy enough with my progress. If you’d like to see the steps of painting this, click “Continue Reading” below. Step one and two, with initial sketching in blue pastel pencil and then thinned paint. Step 3 starting to add some colors. …and more color. And then I guess I stopped taking photos between here and the end. Jana! I do think you nailed it!! That bit of reflected light in the bulb end of the daff is just perfect! 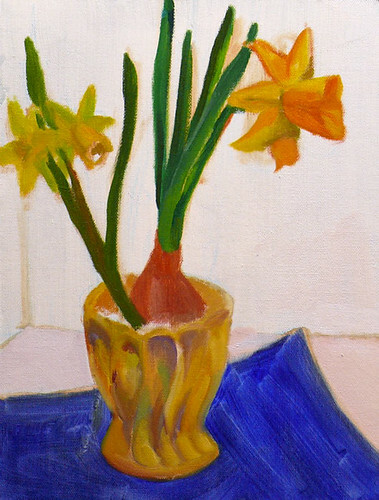 The glow on the pot, the shading on the vase curves, the brialliant, transulcent yellow — it’s glorious!!!! I LOVE IT! I love this Jana, especially the echo of the curving of the daffodils in thesensual curves of your pot. It is almost as thought there is a dance going on here. I understand that there is always more to do, learn, experiment with and such, but these are all simply fabulous, thanks for sharing the process. 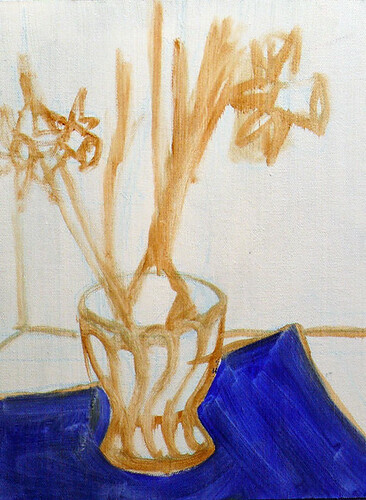 Lovely composition and shapes and perhaps the flatter use of paint here works better than the Van Goph thick paint in the daffodils of your other painting. 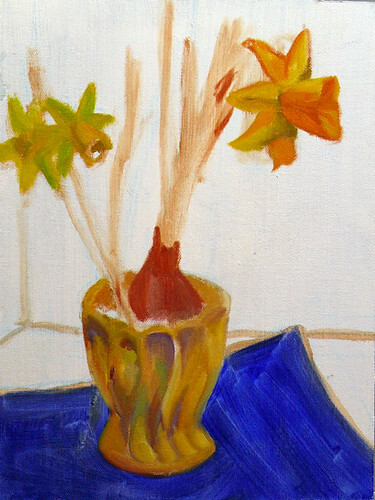 I like this but must say, for me, the heavier paint just draws me, it’s what I love about oils. Very nice touch with the slightest suggestion of the painting on the wall behind the daffs. Love the folds and color in the blue cloth! This really is quite beautiful!